Excited that Beyond issue 2 is out. Alongside luminaries both literary and architectural including Douglas Coupland and Francois Roche, I have contributed a short story titled “Everything Dale Myres Could And Couldn’t See”. The story chronicles a digital animators increasing obsession with the assassination of JFK which leads to ever more byzantine recreations of Dealey Plaza and other sites noted for their conspiritorial nature – kind of Dan Brown via Nikolaus Pevsner if you will. “Using Lightwave, Myres had been constructing a model of the assassination of President Kennedy. He began to collect data and documents, feeding the information into his model: the geography of Dealey Plaza, the positions of the waving crowds, the architecture of the Book Depository, the position and size of trees began to be mapped out. Myers assembled a growing library of documents, maps, newspaper reports, eyewitness accounts and photographs, triangulating between them to pinpoint positions, double check measurements, map out the sequence of events. As Myres worked through his project he felt a sense of abstract stillness leaking out from his screen. Myres’ idea was that something of the clarity of his mathematically described environments might be able to be mapped onto the landscape of the real world. That somewhere where the direct relationship between action and reaction, between intention and effect were immediate might be able to inform to a place and a moment that seemed to represent the degree zero of the unresolved and unknowable. Through this, a non-negotiable truth might emerge. Myres scrutinized each moment, movement and every object. He would draw diagrams, list material properties, note proximities and relationships to other objects forming a master taxonomy of the things that had occupied Dealey Plaza on November 22nd 1963. Various 2 to 6 foot (0.6 to 1.8 m) tall bushes, trees, and hedges. Myres digital simulation of the Plaza grew. To assist, he built physical models which he could begin to inhabit. A 1:20 version of the grassy knoll, a 1:1 section of the Book Depository. Masking tape mapped out Elm Street over the studio floor. A desk stood in for the Presidential limousine. Myres walked around. He stood in Zapruders position. He stepped back and right as though he were standing behind the stockade fence. He crouched, occupying the space where Kennedy’s head took the first impact of the bullet. 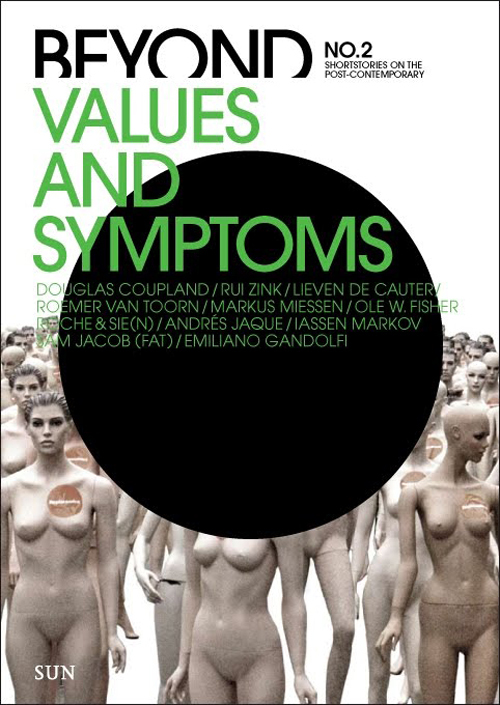 If you want more, you’ll have to buy Beyond Beyond: No.2: Values and Symptoms . Beyond is a great addition to the pantheon of architectural publishing. Edited by Pedro Gadanho it provides a space for architectural writing (and writing about architecture) outside of journalistic or academic confines. Instead by embracing the fictional and the narrative it begins to show alternative ways of writing, thinking and representing architectural ideas – which might be closer to ‘truths’ than the supposedly factual or the heavily footnoted.